This is more than a gentle nod to one of my most favourite Ottolenghi salads. The original is without avocado and uses sundried instead of sunblush tomatoes. It also recommends manouri rather than halloumi. If you're not familiar with the original, I cannot recommend (either of) his books enough. And if you are? This is a slightly creamier take on it. I find the avocado goes beautifully with the courgettes, and I slightly prefer the softer, less chewy flavour of the sunblush tomatoes. Blitz all the dressing ingredients together in a blender, then set aside. You may find you need to crush your garlic first - my blender struggled a little to chop it. Then, cut the courgettes into approximately 6cm chunks and slice lengthways into 5mm ribbons.Using either a griddle pan or a George Foreman, grill the courgette until they have charred marks on both sides. 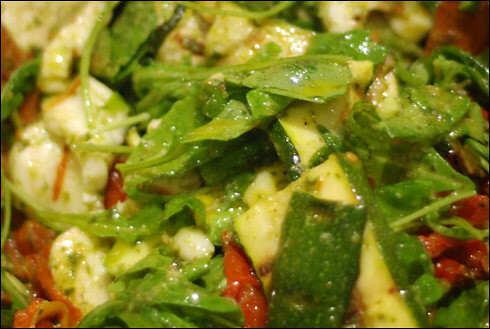 Put the rocket into a large salad bowl and then add the courgettes on top. If like me, you have cheated and used bought sunblush tomatoes, transfer the tomatoes across the the bowl and pour the flavoured oil into your dressing and give it a final blitz. Slice the avocado and add to the salad bowl, then finally grill the halloumi, place it in the salad bowl and dress with the basil vinaigrette. Make sure you have a crusty baguette on hand to mop up all the delicious juices at the end! Now this sounds like my sort of thing! Halloumi is pretty much the only cheese I'll eat (aside from a tiny amount on a pizza) and courgettes are my favourite ever! Although, I've never actually tried avocado! Mmm and tomatoes and basil and rocket! I'll confess now that I've never made anything you posted here, but I WILL try this for sure! i love avocado, but i think it can be an acquired taste! make sure you get a ripe one (the skin should yield a little when pressed) or they can be horrible! they just add a delicate creaminess to this i think.